It was challenging enough for marketers to try to understand their customers back in the desktop era, but today's multidevice world makes it even more difficult. Enter Google, which just launched a new suite of tools designed specifically to make that process easier. 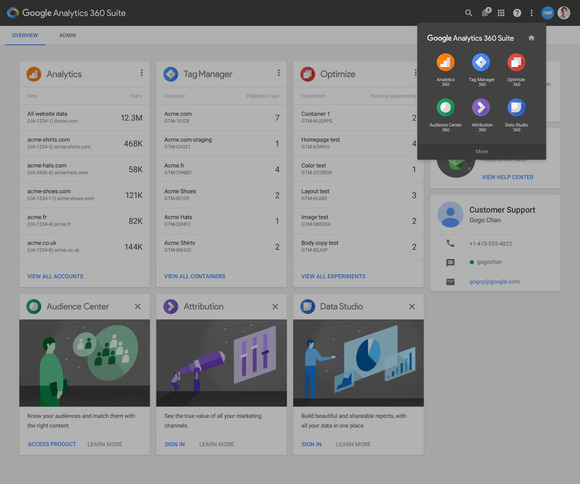 Unveiled on Tuesday, the Google Analytics 360 Suite is a set of integrated data and marketing analytics tools designed to help enterprise marketers reach customers with the right message at the right time. Six tools make up the new suite, four of them brand new. Google Audience Center 360, for instance, is a data-management platform aimed at making it easier for marketers to understand their customers and find more like them across channels, devices and campaigns. It offers native integration with Google and DoubleClick, and it's open to third-party data providers as well. Google Optimize 360, meanwhile, is a website testing and personalization tool designed to help marketers deliver better experiences. Google Data Studio 360 focuses on data analysis and visualization, integrating data across data sources and turning it into interactive reports and dashboards. The software taps Google Docs technology for real-time collaboration and sharing. Then there's Google Tag Manager 360, which promises a simplified way to manage the lifecycle of the e-marketing tags used to integrate third-party software into digital offerings. Finally, the last two tools in the suite are renamed versions of existing ones. Google Analytics 360, for instance, was formerly known as Google Analytics Premium and will focus on measurement and analysis of customer data. Google Attribution 360, formerly known as Adometry, aims to help advertisers evaluate marketing investments and allocate budgets. The suite offers integrations with many third-party data providers and platforms, Google said. It also plugs into Google AdWords and DoubleClick Digital Marketing. All four of the new tools in the suite are currently in limited beta. The new tools "appear to be powerful and built for the current fragmented market reality," said Greg Sterling, vice president for strategy and insights with the Local Search Association. Integration and accessibility may be their chief differentiators, Sterling added. The suite's user-friendly interface is particularly critical, said Denis Pombriant, managing principal at Beagle Research Group. "The analytics need to fit the marketer, not the other way around," Pombriant explained. "I think this does that." Before jumping on board with the suite, though, marketers would do well to ask some basic questions, such as, "What are my customers' moments of truth?" and "What are the things they approach me for?" he added. "It's a small list, and I think analytics would be more effective if we went after that list rather than attempting to boil the ocean with powerful analytics," Pombriant said.